Some of the best memories a person can make in their lifetime are the ones in which you’re surrounded by your closest friends and family. The connections you make with relatives, school companions, and even co-workers mold your very being, and the best ones help you grow and improve overtime. 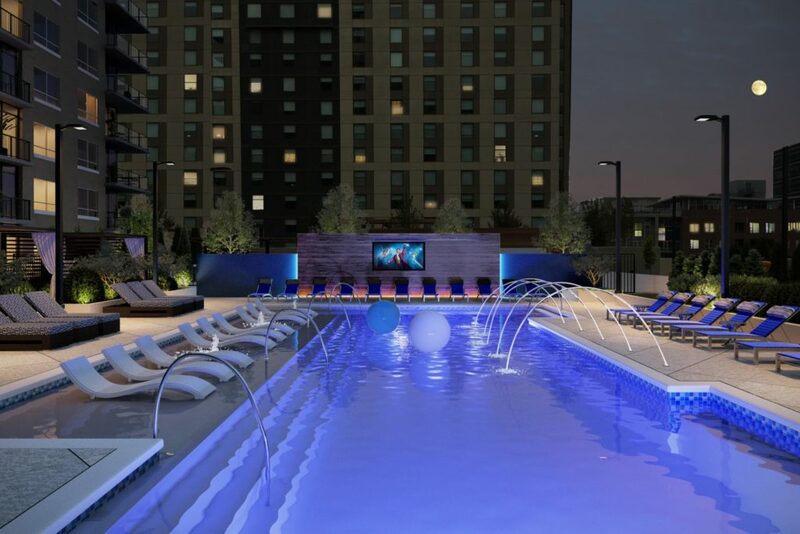 Our luxury Atlanta apartments at Alexan on 8th have a wide assortment of fun community amenities to gather your loved ones around, whether you’re looking for a huge and exciting party or a subdued chat over coffee. For starters, summer lovers will love our resort style pool, full of heated saltwater to keep the waters comfortable all year long. There’s also a large sundeck perfect for soaking up that healthy dose of vitamin D, shaded pergolas to stay cool, and a 90” HDTV screen to view films while wading around in the water. Our grilling stations come with Big Green Eggs and picnic areas to enjoy delicious barbeque. Step up into our rooftop deck and admire beautiful Atlanta views while gathered around the fire pits or playing some games. You can even have man’s best friend join in thanks to our pet-friendly community and our expansive rooftop dog park and grooming station. Weather too rainy or cold? No worries; take your party inside. Our exclusive clubroom features comfortable lounge seating, billiards and ping-pong tables, and complimentary Wi-Fi, along with an entertainment kitchen for serving tasty treats and catering. Invite some friends over and make more joyful memories here at Alexan on 8th. Take a tour of our delightful luxury Atlanta apartments and community today.